Shri Guru Ravidass Ji was born at Sheer Goverdhanpur in Benares (Varanasi) U.P., the sacred city of Hindu religion, in northern India in the year of 1377 A.D. [ 1433 Bikrami Era ]. At this time, the religious situation in India was highly complex and the tyranny of high-caste society towards poor people was very strong. 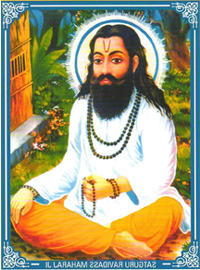 Shri Guru Ravidass Ji was one of the prime exponents of the Bhakti Movement. a socio-religious programme which aimed to reform society through the preaching of “Bhakti(devotion) to God” and the “equality of humankind” and that through this, God was accessible to all. Against this background, Shri Guru Ravidass Ji struggled for justice, equality and social freedom and fought a relentless war against the high caste society to achieve this. Today, we all are inspired by his philosophy which encourages us to create a castless society where all may live with equal rights and freeform. Shri Guru Ravidass Ji left his body at Chattorgarh to merge with the eternal light of god in 1584 Bikrami Era, leaving his teachings and philosophy for us to follow, to live a better life in this world. As you are aware that Shri Guru Ravidass Cultural Association Darlaston is in the process of building a new Gurdwara. We humbly request you to donate money for this noble deed. Any Shri Guru Ravidass Sabha or organisation who donates £ 11,000 or any individual who donates £5100 shall have their name showcased within the Gurdwara. We also request expertise advice, donations of materials, tradesmen’s time, Sabhas and individuals for loans which shall be returned with thanks. Contact :07713789237 (Mr. R.k. Mehmi) President | 07796435448 (Mr. Dev Raj Mahey) Gen. Secy.